Do you often find yourself wishing for a few extra minutes (or hours) each day? I think we’ve all been there, but as educators, a few more moments to grade those stack of papers or extend the perfect in-class discussion seems impossible at times. So, the idea of introducing a “technology” tool to the daily mix may just feel like the proverbial straw. In reality, having an online tool that brings it all together may be just what the doctor ordered. Here are a few common misconceptions that may accompany LMS discussions (and how to overcome them). Educators have many demands, and we can sometimes feel that anything new is simply “one more thing” that requires our attention. Rather, a solid LMS will offer a streamlined approach to facilitating all the intricate facets of an instructional day. It serves as a hub of content sharing, conversation starting, and collaborative learning. With the right LMS, grading time is reduced, workflows are improved, and you’ve got a course you can easily use year after year. Instead of spending valuable class time each period opening and closing websites, directing students to different content repositories, and taking home a mountain of papers, everything now happens in one, intuitive platform – and that equals more time for learning. Let’s face it – there are a lot of LMS options out there. But when I hear from educators that they become “lost in the clicks” or they “can’t find anything because it all streams together”, then it’s time to re-evaluate the effectiveness of their current solution. 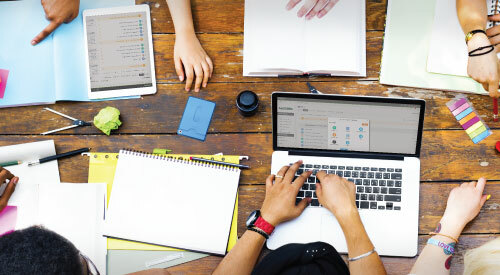 A well-constructed learning management system will simplify course design with an intuitive interface that lets teachers easily create, upload, organize, and deliver content. Think of it as the open highway versus downtown traffic. When a platform is designed for thoughtful organization and delivery, pressure is removed from the teacher to be a web design expert and confidence is gained in the ability to effectively use technology to drive student outcomes. Learning platforms shouldn’t get in the way of a teacher’s ability to facilitate engaging and impactful instruction. Scope and sequence matter. Instructional design matters. A clear learning path defined by modules that are easily adjusted, hidden, and copied to other courses will ensure the ability to easily front load content. A user-friendly interface will improve the information exchange, keeping the focus on student learning instead of endless clicking, scrolling, and folder sharing. For 1:1 learning environments, I agree that an LMS is a vital component to facilitating blended and online instruction. I would also argue that a teacher with only a scattering of devices handy, or perhaps relying on what’s available from home, would benefit equally from a tool that supports anytime, anywhere learning. Giving students access to valuable resources on-the-go not only supports how they access information, but it promotes individualized learning and lets them set the pace. Even if you’re faced with only a couple of laptops or tablets in class, an LMS makes it possible for students to access targeted resources independently, allowing the teacher more time to assist students who may need additional support. Regardless of your in-class tech availability, an LMS offers an invaluable opportunity to promote school-to-home connections. Parents can access resources from any device and play a more active role in their student’s academic progress. Communication becomes more fluid and all stakeholders can celebrate the victories both in and out of the classroom. And just in case a 1:1 might be in your future, my experience has been that putting an LMS in place ahead of the rollout eases the transition and gives teachers confidence in a tool that will become a critical part of their daily instruction. In the quest for purposeful and impactful teaching and learning, evaluate your goals and seek out solutions that propel you towards the finish line despite misconceptions that may exist. An LMS might just be the glue that binds it all together. Previous PostGo Paperless with Formative, Seesaw, and Showbie!